Have you ever wondered what movies puppets like to watch? 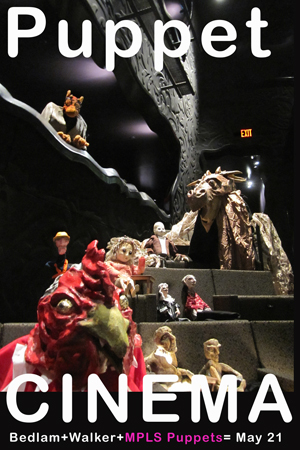 So we asked Bedlam Theatre and more than a dozen local puppeteers to come hang out in the McGuire and create a wild puppet world populated by 150 of the Twin Cities’ weirdest, most arresting puppets, large and small. They’re all sitting in the theater (or hanging from the ceiling) and watching a mash-up of their favorite puppet films, created by filmmaker Ragnar Freidank, a collaborator of Julian Crouch from the UK troupe Improbable. We are calling it – Puppet Cinema for Puppets – An Unlikely Installation, and it’s presented in association with Improbable’s The Devil and Mister Punch, May 19-21. Join us at two free open house events, where more than a dozen featured local puppet creators will be on hand to meet and talk all manner of puppet subjects. Open prior to all the Devil and Mister Punch performances and for one full special day on Saturday May 21, 2011 during gallery hours (11am – 5pm). Copresented with Bedlam Theatre and the National Performance Network (NPN).